Pooch & Mutt Bionic Mobile Bones is a concentrated canine joint supplement of superb quality designed to complement your dog's daily food intake. 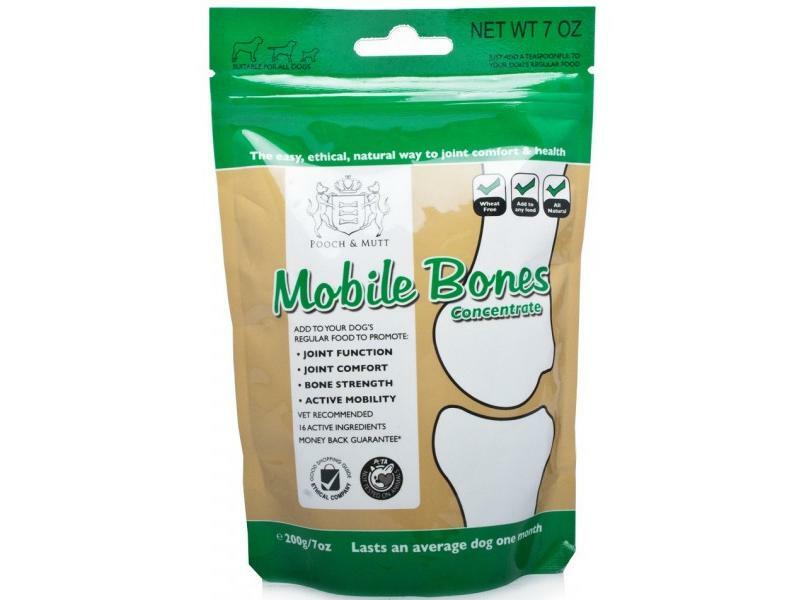 Using top quality ingredients including human grade natural extracts, Mobile Bones encourages mobility, prolonged agility, normal joint and bone health. Below are some recent questions we've received regarding Pooch & Mutt Mobile Bones Joint Supplement for Dogs, including answers from our team. My pointer puppy is 7 months old and unfortunately fractured his femur after jumping and landing badly on the laminate floor 6 wks ago. He had the fracture pinned and wired and the vet says we can now walk him on the lead. He is still limping badly and does not put his weight through that leg. He has daily meloxicam prescribed from the vets. I have given him synonquin growth tablets from 3 months old. Would this product be of more benefit and is it okay for puppies ? For a puppy with a fractured femur, the main thing you can provide as far as nutrition is concerned is just a good quality, balanced diet. The meloxicam is sensible enough to help relieve discomfort and the Synoquin might well help keep the joints as healthy as possible. I fear that if your dog is not bearing weight well after 6 weeks, then there might be a surgical complication. Your vet could perhaps x-ray the fracture site and assess things that way. The Mobile Bones supplement will do no harm and you could change it for the Synoquin, but it is a minor factor compared with the others involved. That is a good question and the answer is yes. The toxic element found sometimes in grapes has not yet been identified to my knowledge, but resides within the flesh of the grape, not the seed. Grape seeds and grape seed extracts have not been associated with this odd (and unusual) toxicity, so this product can indeed be regarded as safe.